It's a relatively simple mathematical calculation to quantify the negative impact of bullies in the workplace, yet managers in organizations everywhere allow toxic behavior to persist. This week's object lesson comes from the NFL Miami Dolphins, where a professional athlete left the team due to persistent harassment and bullying. While the full story is not yet known, there are certain unassailable facts: at least one protagonist with a long record of impulsive behavior has acknowledged coercing a teammate into contributing funds to a Vegas vacation, directing ethnic and homophobic slurs at this teammate and engaging in physical and mental abuse, all in the spirit of hazing -- a long and misguided tradition of veteran players "riding" younger players. The protagonist is not merely a veteran teammate, he's also on the team's leadership council. There has been a large public outcry leading to the suspension of the protagonist, the victim hiring a lawyer and the team owner demanding a full investigation. Sadly, but perhaps predictably, the segment of sports punditry comprised of retired athletes has defended the protagonist thusly: One can't possibly understand what goes on in a locker room unless you're part of the team; the victim walked out on his team during a competitive season, thereby revealing his true character; and the protagonist's actions were merely "boys being boys." One retired coach called the victim a "baby" and waxed philosophic about "Back in my day when men were men..." Others accused the victim of gamesmanship, suggesting his failure to report these allegations earlier and his supposed camaraderie with the protagonist demonstrates disingenuity. In response, the victim acknowledged a fear of retaliation and the loss of his livelihood as reasons for not stepping forward earlier. We'll learn more as this story unfolds, but we know enough to recognize a hostile work environment. Why? Because nearly all of us have witnessed such bullying in our own workplaces. In the corporate sector, the toxic personality often takes the form of a top-producing salesperson who breaks the rules, fails to properly document activity, over-commits the organization to meeting a client demand, and then bullies colleagues into delivering the impossible because, as the old saying goes, "nothing else matters until we make a sale." It can also take the form of a long-entrenched manager who has watched leaders come and go, who has watched strategies come and go, who has watched competitors come and go, and all the while she's tending to the company's day to day needs. She truly believes her steady hand on the rudder is the primary driver of organizational success in an ever-changing marketplace, and so when presented with new and uncomfortable ideas her knee-jerk reaction is "We've tried that before and it didn't work. Next!" 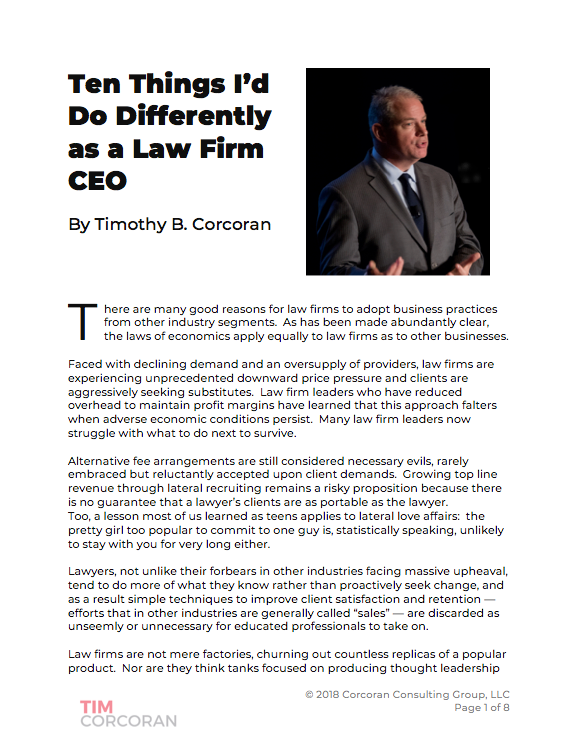 In law firm land, the corollary is the toxic partner, that rainmaker bringing in millions in billable hours, or the long-established patron of the corner office whose reputation is unassailable and who can do no wrong. Whether the partner cycles through secretaries like others change their socks, or metes out punitive assignments to associates who fall out of favor, throwing tantrums in the office when the staff fails to read his mind or demanding that others adhere to stringent work requirements out of some vague allegiance to client service, these actions constitute a hostile work environment. Worse, if the toxic partner is acting under the delusion that such actions will improve team performance, she or he is assuredly provoking the exact opposite outcome. We've all seen the feel-good movies where a tough-as-nails but kind-hearted leader drives his team to victory by forcing everyone to reach deep inside, to unlock that extra courage, to go that extra mile. And there's some truth to that, of course. Any coach knows that even high performers often need external motivation to break through barriers. But how much is too much? The underlying math in any organizationt is simple, requiring us to balance the revenue generated with the costs incurred. But too often we fail to complete the equation, focusing solely on the revenue side. So the rainmaker generating millions of billables earns a free pass, or perhaps only an occasional private "talking to" when his conduct falls too out of line. But when we factor in the victims' lost productivity due to distraction or emotional detachment, the cost to continually recruit and train replacements, the sub-optimal work product that results from star performers avoiding collaboration with the toxic partner, the client defections, and more, this "total cost of ownership" will invariably tip the scales in the other direction. There is NO financial reason to perpetuate a hostile work environment. There is ALWAYS a long-term loss in revenue and profit when such a situation is allowed to persist. If you've done the math and somehow produce a result that says otherwise, I challenge your approach. There are protections in place for whistleblowers for a good reason: people often won't speak up for fear of retaliation, because they fear the loss of their income and job security, because they feel they'll be shunned by colleagues for impairing the team's performance. Rather than discourage open talk, we should encourage it. If there's a toxic personality creating a hostile work environment in our workplaces, as managers and leaders we need to step up and address the situation directly and immediately. If you can't summon the courage to do so because it's the right thing to do, then take action because such an environment is unquestionably impairing the team's performance. Why in the world would you take money out of your own pocket to reward some immature buffoon's temper tantrums or locker room behavior, when the alternative is to excise the annoyance and improve both morale and financial performance? Not every workplace has a toxic personality. But if you have one, or more, take action today. Epilogue: The Miami Dolphins had a .500 record when the above incidents came to light, meaning their next game would literally put them on the path to a winning record or a losing record. The team lost its next game to a previously winless opponent.